Discussion in 'Slashers' started by Suicide, Mar 16, 2003. It's about this 80's metal band "Solid Gold" who are so girly looking they make Warrant look like badasses. They're out in the mountains filming some hilariously tacky video that consists of footage of the band members looking intensely at the camera making that "puckered up lips, teeth grinding together" face and trashy girls wearing tiny clothes dancing around. Meanwhile there's a hermit family that's been living right by where the band is staying during the video shoot. Eventually the two groups meet up and lot's of people die. As a movie, it's crap, but it's pretty goddamn hilarious crap. With some fun murders (somewhere around 20) and plenty of trashy broads, it's worth a look if you can find it. I got my copy for $2 off of eBay, so if any of you collect OOP videos this ones pretty cheap. For a better review cheak out this site I just discovered http://www.hysteria-lives.co.uk That's where I found the cover art above. Great site for Slasher fans, almost 200 reviews there. The guy who runs the site sometimes posts here, hope he doesn't mind the picture thievery, it's damn near impossible to find a picture of it. So anyone seen this one? I really need to rewatch this again to refresh my memory though. The guy who runs the site sometimes posts here, hope he doesn't mind the picture thievery, it's damn near impossible to find a picture of it. So anyone seen this one? ... hey, I don't mind, at least you quoted the site, which is more than can be said for some on other sites I could mention! 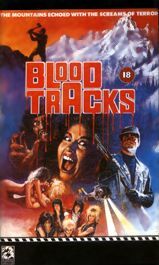 I'd love to see an uncut version of BLOOD TRACKS one of these days. About that. Does anyone know if the uncut version is out there. This film was just mentioned in a thread about The Prey so I thought I'd ask. There are definitely cuts in the version that I saw as a child which is most likely the version I just watched for a second time months ago. Unlike The Prey, the cut scenes in this film would actually be horror related so it would be nice to see it in full. I'd love to see an uncut version myself, the VHS seems brutally edited! I'm the one that name-dropped it in the thread for The Prey. This and The Prey are the only two horror VHS movies I own that were released in clamshell cases. I really enjoy this movie! It definitely has it's problems, such as severe lack of character development. But there's some really great stuff in here. It's kind of a mash-up of The Hills Have Eyes, heavy-metal horror, and winter-time slasher. The movie is about a rock band shooting a music video up in the mountains, and in the process they trespass on a cannibal family living in an abandoned factory. The film crew is snowed in when an avalanche buries their cars. 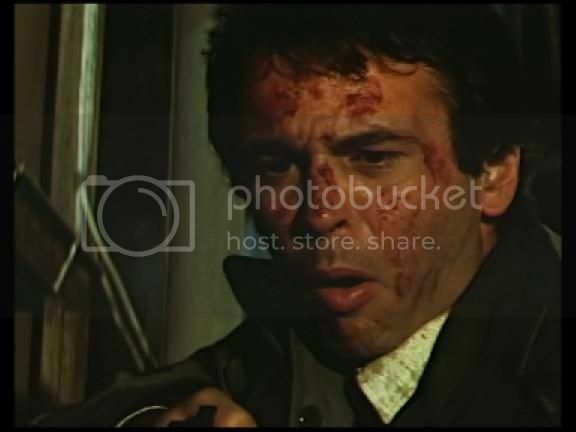 One group of the film crew search the factory for their missing friends, while the band members stay at the cabin (which of course, is soon attacked by the cannibal family). The movie is very short, fast-paced, and fun! A few of the cannibals are pretty creepy looking! There's a really creepy bit where the filmmakers are reviewing their video footage, and slow motion reveals a face in the video. Later, one of the girls is airing out her sheets on the back porch when one of the cannibals appear behind the sheet and drags her into the woods. Really cool scene. Also, the entire factory is filled with bobby traps. When one of the guys approaches to help a girl who is strung up in front of him, he accidentally sets off a trip-wire and the girl ends up getting split in half. 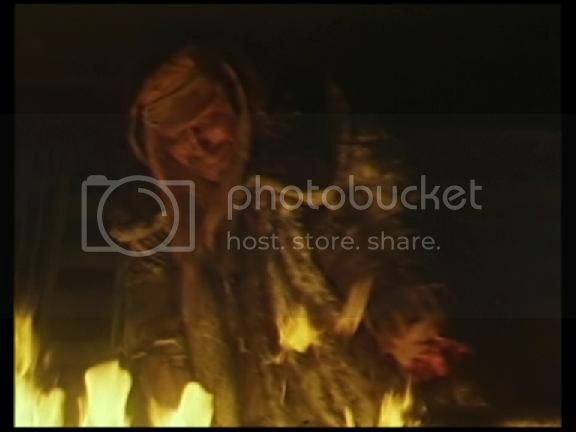 I do have a major complaint though, the VHS seems very brutally edited! Despite the very high body count, there really isn't much gore shown. The editing becomes very fast and choppy during all of the gore scenes, it really appears that there is a lot of gore edited out. There is even a picture on the back of the case that appears to be from an uncut version of one of the death scenes. There is no rating anywhere on the box or tape itself, so it doesn't appear to be a result of the MPAA. I would love to get my hands on an uncut version, if one exists. The VHS I have was released by "Vista Home Video". That's some pretty nifty coverart. It sounds like this is the most "complete" release thus far. ^ Very interesting, especially the inclusion of the alternate takes. I assume the gore is still missing though? Thanks for the heads up. Hopefully, one of us can find a good review of this release in the coming months and get back to this thread. For some reason, probably because of childhood memories, I am fixated on seeing an uncut version or something close. This would be right up Code Red's alley. The new German (PAL) DVD from CMV has a running time of 1:24:57 (85 minutes) which is longer than my old crappy looking bootleg. I have no idea what the running time on the various VHS/DVD releases of the past had? It comes in a nice hard clamshell case, which is a little taller than a normal DVD keep case. The Japanese "alternate scenes" are shown as running split-screen comparisons with the original English-version scenes. They're basically just alternate normal scenes, no extra gore/kills. The transfer actually looks pretty good, certainly better than I've seen it in the past. The audio also sounds quite clear and the stereo has definite channel seperation (not false sounding stereo) that can be heard. Nice work, Kat! I should get this, then. I always liked the clamshell style case. Sh!t. It's sold out at Diabolik. I own the clamshell VHS from Vista Home Entertainment, and the back of the case says 82 minutes. I haven't actually checked the running time on the tape itself, as the cases are sometimes wrong. But 82 seems rather specific, as opposed to 80 or 85. So it is possible that this DVD might be longer than the VHS. Also, considering that the DVD is in PAL, that means it would be even longer. The bootleg I had on DVD-R was sourced from a VHS tape, and runs just over 81 minutes. It's a good 3½+ minutes shorter than the PAL DVD...so there must be something longer in there, but I haven't had time to compare them. Is there anywhere else to grab this?...google search only comes up with Diabolik links. It looks to be all European mailorder sites though. I contacted DiabolikDVD. They have more on the way!